If you're looking for a change of scenery in FarmVille, good news: Zynga's got an expansion with a different theme in the works. It's no secret that a huge source of Zynga's billions has been the runaway hit that is FarmVille. As a result, it shouldn't surprise anyone that the developer is launching an expansion to the game, though the new setting is a bit different from what players are used to. The expansion, FarmVille English Countryside, is set to launch sometime in the next few weeks. 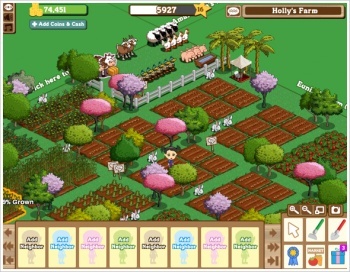 Players will still be able to use the current FarmVille application on Facebook, but they'll be able to create a parallel farm to the one they have in the main game. The new farm will be set in the titular English countryside with corresponding themes for landscapes, animals, buildings, etc. Oh, and there will also be a mini-game that allows players to breed sheep. According to VentureBeat, the expansion is part of Zynga's plans to boost its player population: "FarmVille has been in a steady decline as Zynga focused on launching other games such as FrontierVille and CityVille. The game now has 44 million monthly active users and 14 million daily active users."